We are your business marketing team. We are a team of folks lead by Stephanie Weber. We have the team to meet your needs - from an amazing graphic designer to a fantastic copywriter (no, she did not write this). We are results oriented and ready to help! As an owner/consultant, Stephanie will be your main contact at OurMarketingPerson. 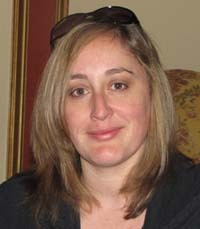 Stephanie has extensive experience in marketing (online and off). She likes to say she has a strategic marketing mind but yet roll up your sleeves and get your hands dirty attitude. Previously Stephanie was Marketing Director at a professional photo retailer. She started her career in advertising and transitioned to client side work shortly after (she knew large companies and agencies was not for her). She has worked in various industries including insurance, software, hardware & online retail. She got her undergraduate degree from USC and her MBA in Marketing from the University of Notre Dame. (as you can probably guess, she tunes out during football season as it gets a little complicated) Her post MBA working career includes Wine.com, where she started did project management & she managed the Wine.com website - helped grow online conversion by 40%. She then transitioned to Shutterfly where she focused on customer acquisition. She managed a multi-million dollar organic and paid search program where she grew new customers and revenue by 60% year over year. At Shutterfly she also managed various customer acquisition programs such as partnerships (Results: Grew new customers by 32% and average new customer spend by 44% year over year), gift cards & prepaid products (Results: 68% increase in gift card & prepaid product sales) lead generation & online sharing. Oh, and if you can't tell, she is really focused on results. She decided to start OurMarketingPerson after speaking to a variety of local businesses who just had no idea what to do to grow their online marketing presence and could not afford the traditional "consultant" & marketing fees. At the same time, she wanted to be closer to home (commutes are just no fun) so she can spend more time with her two young kids. Stephanie is on the board of the Coastside Child Development Center (CCDC) & Elkus Ranch. Both are located in Half Moon Bay, California. She enjoys photography (yes, it is one of her big passions) and spending time with her family.